At first Erez started with learning the land, taking what he could from it and selling it to whomever was interested. Soon, the vines got a strong reputation and they sold out quickly. One of the most famous was the 2002 Carmel Merlot, Kerem, Har Bracha, which was very well received by all in the wine business. It was after the 2002 vintage that they realized that there was more to life than selling their toil, it was then that they decided to incorporate the toil into another branch of their livelihood – making wine. In 2003, they kept some of the fruit, enough to make 1200 bottles, calling the wine Erez, in eponym to his own name. As the winery and its production grew, Erez decided they needed a new name. Initially they fell upon the name: Tura, without much reason, but as they investigated, it turns out that Tura has many meaning in different languages. Tura means mountain in Aramaic (Tura Brichta), coming from the fact that the prized vineyards that Erez planted are on the top of Har Bracha, AKA (Blessed Mountain) or Tura Brichta in Aramaic. The other word is rook (in chess) or castle in Italian or French (feminine) respectively. Which is why the winery’s logo is a castle. In 2007,Erez planted another 30dunam of vines onHarBracha and he followed that up with yet another 100dunam in 2009. The vineyard now consists of some 250 dunam of Cabernet Sauvignon, Cabernet Franc, Merlot, Shiraz, PetitVerdot, Pinot Noir,Malbec, Gewurztraminer, and Chardonnay grapes. The thing that makes Har Bracha Merlot so spectacular is the bracing acid that comes from the cool mountain vines. The Cabernet Sauvignon is OK, but the Merlot grape seems to grow there so well that it takes your breath away. It has ripe fruit notes from the hot days and the bracing acid from the cooling evening that are accommodating because of the 850 meter elevation and because of the westerly winds. The mountain is covered on most winters and the mountain is enveloped in mist in the mornings. The last time I was there in 2014, I was greeted by the wine hand roasting a duck in a old metal barrel – the smell was intoxicating. When we returned this time, I jokingly demanded a duck, but sadly, it was not on the agenda. As we drove up to the winery from the coast, we were heading towards a small (moshav) called Rechelim. The town is named after two women named Rochel (Rechelim is plural for Rachel or Rochel) who were both killed in terror attacks on the adjacent roads. 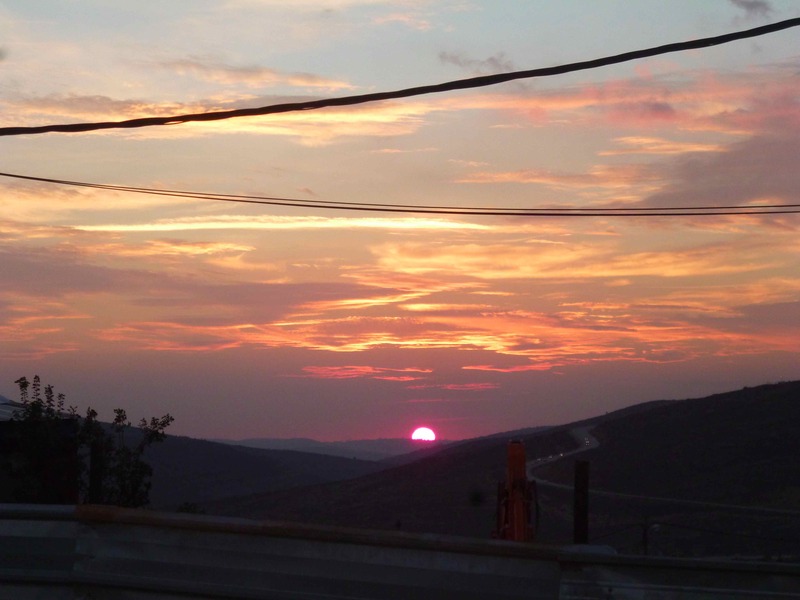 The town is a small settlement that was only recently recognized as a town, in 2012 to be exact, and it is situated on Route 60, between Kfar Tapuach and Eli. The town is home to some 35 or so families, and has always been the home of Tura Winery. As we approached the winery, the sun was at high noon, vastly different from the past two times when the sun was setting by the time we made it to Tura Winery. The winery itself has recently undergone some rather serious renovations, including the lovely new tasting room, the winery itself (which is in an attached adjacent building), the barrel room, and the wine store. We were met by Vered and later Erez joined us for a moment, as they were racking wine and getting ready to bottle some special runs of wine for clients. Later, Rachamim (Erez’s brother), the mashgiach (kosher supervisor), also joined us. Erez and Vered started with apple trees and then moved to vines, but they did not forsake the trees and they did not stop their agricultural pursuits when they started their winery. To the contrary, they expanded their apple orchards and they planted and acquired olive trees, from which they harvest and press olive oil every year, which is sold in the winery. The apples are also not left out of the liquid party, they are used to make hard apple cider that is also sold at the winery. One final note before I start talking about the wines. The winery has changed all of its labels and it has created three lines of wines, all themed after the vines and the winery’s mountainous perspectives. The first level is called Mountain Vista, this is where the Gewurztraminer is placed, the Chard, the rose semi sweet wine, Pinot Noir, and the new Heartland Blend. The next level is now called Mountain Heights. In this label you will find the Portura, Shiraz, Merlot, and Cabernet Sauvignon. Finally, there is the flagship blend wine – called Mountain Peak. I personally like the new labels and the themes – all stemming from the original flagship wine named Mountain Peak, for the grapes being sourced from the very peak of Har Bracha, for their top wine (akin to Adir Winery’s Plato – though not in style or ripeness in any way). The tasting started with the newest wine to Tura’s portfolio; the 2014 Gewurztraminer. I am not normally a huge fan of sweet wines that are not meant to be sweet wines; AKA off dry white wines. However, the Gewurztraminer from Lueria and from Tura are both perfect examples of wines that are off dry but lovely, well made, acidic, and balanced. The next wine was the 2013 Chardonnay, which was nice, but not that complex in nature. The next wine was yet another new wine to the portfolio, the Heartland blend. I really liked the new blend, it allows Tura to make use of their Cab and Shiraz grapes in a way that highlights them far better than off on their own. I did not taste the Pinot Noir at the winery, but I did taste it on my own, and I enjoyed the 2013 vintage. Next was the highlight of the tasting, the 2011 Tura Merlot. What a lovely wine that is. Truly one of the best Merlot out of Israel. Finally, we had the 2012 Mountain peak, a lovely Israeli Bordeaux blend and then the newly named 2014 Rose Valley. Its previous name, Mountain Rose, was too confusing with Mountain Peak. The wine notes follow below for last year and this year’s visits. Also, my many thanks to Vered, Erez, and the entire crew who made our stay a joy as always! The nose on this light gold colored wine is filled with smokey toast aromas, sweet vanilla, along with a rashly baked peach cobbler, quince, slate, mineral, and grapefruit. The mouth on this medium to full bodied wine is quite lovely with sweet controlled fruit, white peach, brioche, and good layers of nice tart and fresh fruit. The finish is long and spicy with spicy oak, nutmeg, cloves, good acid, and sweet herb. The nose on this purple colored wine is filled with classic Shiraz notes, with lovely floral notes, with smokey notes, roasted animal, blackberry, licorice, herb, and spice. The mouth on this full bodied wine is controlled, with great acid, sweet notes, and had layers of concentrated black fruit, blueberry, along with ripe boysenberry, sweet cedar, and nice mouth coating tannin. The finish is long and tannic finish with lingering tannin, along with great red/black fruit, more roasted notes, earthy and loamy dirt, and great spice that lingers with black/blue fruit. The nose on this ripe fruit wine is filled with blackberry, plum, date, blueberry, and spice. The mouth on this lovely full bodied wine is rich and layered with concentrated blue and black fruit, cassis, crushed herb, and integrated tannin that melds together well with sweet cedar. The finish is long and spicy with lovely green notes, forest floor, super spicy oak, butterscotch, graphite, and mineral. Blue and black fruit along with spicy oak tannin lingers long with mineral and spice. NICE! As has been the experience I have had with Tura and Teperberg wines, the Merlot wines from the Shomron continue to excel over almost every other region in Israel, other than one or two Yarden vineyards and specific vintages. That said, the go to Israeli Merlot wine for me is Shomron wines, and Har Bracha and Gvaot Merlot trump the varietal options. The nose on this black colored wine is lovely and rich with smelly forest floor, barnyard notes, dirt, and red fruit. The mouth on this full bodied wine is rich and layered with lovely red fruit, integrated tannin, that melds well with blackberry, raspberry, black cherry, and spice, all coming together nicely with rich layers of mineral, spice, slate, and crazy mouth coating tannin that rise. The finish is long and spicy with bakers chocolate, spice, crazy tannin, rich fruit, rich and loamy dirt, with nutmeg, cloves, almond pith and spice lingering long. This wine is a blend of 70% Cabernet Sauvignon, 14% Merlot, 11% Petite Verdot, and 5% Cabernet Franc. The nose on this wine is green and ripe with barnyard, red fruit, and spice. The mouth on this full bodied wine starts with great spice attack and is followed by layers of concentrated fruit, working well with crazy tannin that lingers well with chocolate, sweet plum, hints of blueberry, and spice. The finish is long and mineral, with intense spice, cloves, black pepper, good dirt and fruit coming together and needs time to show leather, spice, butterscotch, and almond pith, BRAVO! This is the first Gewurztraminer from Tura winery and what a hit it is! The wine improves greatly with time. The nose on this wine is so redolent with lychee, mango, guava, pineapple, lovely floral notes, jasmine, and sweet notes.. The mouth on this medium to full bodied wine is clearly sweet with residual sugar, showing well with good acidity, along with melon, rosewater, lovely nectarine, peach, and sweet white plum. The finish is long and sweet, with hints of orange pith, nice nutmeg, lovely honeysuckle, mineral, and honeydew melon that lingers on a long and lightly bitter finish. BRAVO!! I missed the 2011 Tura Pinot Noir, but this wine is truly lovely. This is not a complex wine, but it was a massive crowd pleaser. The grapes are all sourced from Har Bracha like all of Tura’s wines and it was aged in French oak for 10 months. The nose on this lovely wine really opened up after an hour and showed lovely Kirsch cherry, spice, dirt, and rich espresso. The mouth is nice and round with good mouth coating tannin, lovely green notes, roasted herb, currant, with good texture and leather. The finish is long and spicy, with sweet cedar, floral notes of rose, mineral, and nutmeg. BRAVO! The nose is tart with baked apple and summer fruit. The mouth on this medium bodied wine is is richly acidic with tart/sour crab apple, freshly baked brioche, all wrapped in a soft palate, lifted by the bracing acid, pineapple, quince, dry apple, and white cherry. The finish is long and sweet/tart with more baked apple, nutmeg, and spice. This is a lovely wine, a blend of 60% Cabernet Sauvignon, 20% Cabernet Franc, and 20% Shiraz. The nose on this wine is redolent with smokey notes, coming from the 14 months in French and (I think) American oak barrels (or a hybrid barrel), along with plum, raspberry, cherry, earthy notes, and sweet dill. The mouth on this medium bodied wine is soft and round, very accessible with lovely mineral, dirt, butterscotch, blackberry, and red fruits, all wrapped in a cocoon of crazy mouth drying tannin, and oak. The finish is long and mineral driven, with lingering tannin, green notes, sweet dill, graphite, vanilla, and sweet herb. Very nice! I must say, this is how Merlot should be made, beautiful, old world, and lovely! The nose on this wine is rich and dirty with freshly tilled earth, loam, graphite, and lovely black cherry. The mouth on this full bodied wine is lovely, with layers of crazy, draping, mouth coating tannin, mineral, with graphite taking center stage. Showing so old world it makes me smile, with layers of concentrated blackberry fruit, followed by plum, green notes, dill, foliage, all wrapped in a coat of rich extraction, intense mineral, and charcoal. The finish is long and dirty, starting to show hints of barnyard, followed by chocolate, spice, more green notes, dirt, and nutmeg. BRAVO!!! So, this was the most new world wine of the tasting, with ripe fruit but controlled. The wine is a blend of 55% Cabernet Sauvignon, 27% Merlot, 9% Petite Verdot, and 9% Cabernet Franc. The nose on this wine is ripe with blackberry, lovely loamy earth showing barnyard notes, mushroom, rich dirt, and raspberry. The mouth on this richly extracted, full bodied wine, shows draping tannins, butterscotch, vanilla, all wrapping layers of concentrated blackberry, cassis, red fruit, mad mineral, graphite, intense dirt, and herb. The finish is long and extracted with leather, lingering tannin, hints of roasted animal and tar showing hints of reduction and sweet oak. This is a wine that will age beautifully, showing richer leather, tannin, fruit, and charcoal. BRAVO!! To be fair this is a nice enough wine, it lacks the complexity and the sugar is a bit for me, but in the end, it is a pleasant wine that many will like for kiddish or an aperitif. The wine is a blend of Cabernet Sauvignon and Merlot that was stopped before finishing fermentation, filtered and then bottled, to keep its residual sugar/sweetness. The nose on this rose petal colored wine is sweet with raspberry, litchi, kiwi, guava, dark plum, and rich floral notes. The mouth on this medium bodied wine is oily with nice sweetness, nectarine, yellow plum, and red fruit. The finish is long with tangerine, pineapple, nice acid, and mineral. A simple but nice dessert wine that could pair with summer fruit tart or compote. Enjoy! Posted on March 24, 2015, in Israel, Israeli Wine, Kosher Dessert Wine, Kosher Red Wine, Kosher White Wine, Kosher Wine, Wine, Wine Tasting, Winery Visit and tagged Cabernet Sauvignon, Chardonnay, Gewurztraminer, Heartland, Merlot, Mountain Peak, Pinot Noir, Rose Valley, Shiraz, Tura Winery. Bookmark the permalink. 6 Comments. FYI – I bought magnum of the Mountain Orak after we did a tasting last year. A- is an understatement. The wine is fabulous. Also, I believe they are making wine this year under Otzar Beis Din.